The Warriors center exited Monday night’s game against the Clippers with a left quad injury. What could that mean for Boogie’s availability—this season and beyond—and Golden State’s title hopes? DeMarcus Cousins was making an effort play. Less than four minutes into Game 2 of the Warriors-Clippers first-round playoff series, he knocked the ball loose from L.A. center Ivica Zubac and chased it down the floor. It should have been an easy fastbreak dunk. Instead, as Cousins reached out for the ball, his left leg buckled and he fell to the floor; he clutched his left thigh and grimaced with an expression that spelled trouble. 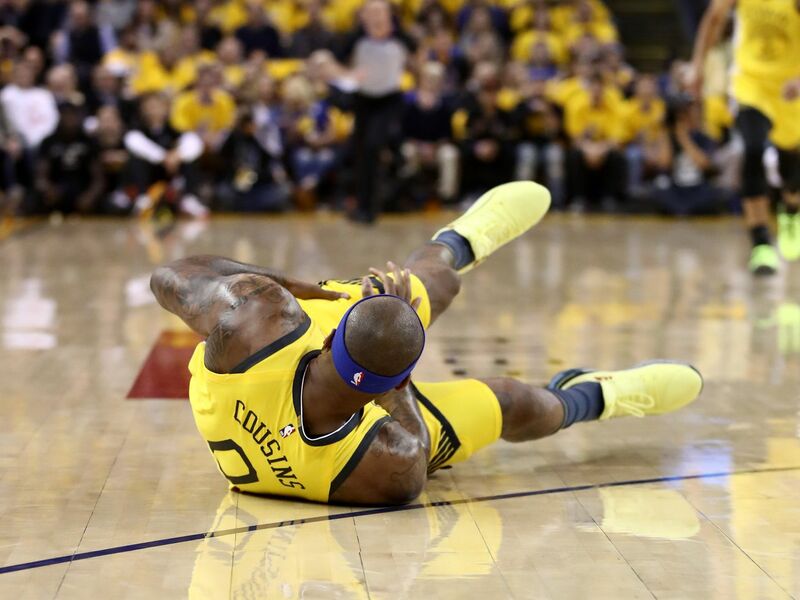 It was a similar scene to one that occurred almost a year and a half ago, when Cousins was with the Pelicans—though when he fell to the floor that time, he was grabbing his Achilles heel. After that injury, he didn’t return to basketball until mid-January of this season. Following Monday night’s incident, Cousins limped off the floor and toward the Warriors’ locker room, shaking his head as if to signal: not this again. Cousins didn’t return to the game, and he’s expected to have an MRI on his left quad on Tuesday morning that will determine the severity of the injury (the picture of it does not look great, and the early reports suggest that it could be a torn quad). His absence wasn’t felt much during the game—even though the Warriors did go on to blow a 31-point lead and fall 135-131—and should he be sidelined longer, it likely won’t have much of an impact on a series played against the 8-seed. But if he’s out past the first round or, say, the conference or NBA Finals, how will that affect the Warriors? One thing is certain: Andrew Bogut has gone from chilling in the outback to becoming a much more important figure in Golden State’s title run. When general manager Bob Myers brought the spindly Bogut back in early March for the playoff run (after Bogut had finished his season in Australia), the move looked like insurance and matchup proofing—but now, it feels like the transactional equivalent of a Kevin Durant dagger in the clutch. If Cousins is out, Bogut’s role will be greatly expanded. To be clear, Game 2 wasn’t exactly a great example of this. When Bogut entered the game at center, Montrezl Harrell drew two quick fouls on him and then dunked on the Aussie in embarrassing fashion. It wasn’t exactly the greatest matchup for Bogut (he finished with three points and nine rebounds in 17 minutes), but his size—and especially his knowledge of the Warriors playbook from his four seasons there—will become handier as the opponents get tougher. Bogut is a great tool to have in a pinch, but if Kevon Looney continues to play like he’s done over the series’ the first two games, Bogut will likely remain a “break in case of emergency” asset. Steve Kerr opted to play Looney at center for a good portion of Monday night’s game; he delivered, scoring 19 points and adding five rebounds in 19 minutes. That came after an absurd plus-30 performance in Game 1 where, though he didn’t score much, he facilitated via screens and showed his flexible defense, especially against the Clippers’ guards. Of course, when you are playing alongside four other All-Stars, there’s only so much sugar you can add to the cake before it’s too much. But Looney seems like the perfect complement. When the Clippers started to pull close in the fourth quarter on Monday, the Warriors opted to close with their famous Hamptons Five lineup—Durant, Steph Curry, Draymond Green, Klay Thompson, and Andre Iguodala—which generally trumps any kind of big man depth problems Golden State may have by simply obliterating teams with its scoring and length (though that wasn’t as successful against the Clippers). Kerr treats that combination of players like a sleek sports car he only drives on the weekends, but in the playoffs and in more competitive series (ahem, against the Rockets in Round 2), it should get more run. When the game appeared to be out of hand Monday, Kerr also played Jordan Bell, who has been used sparingly this entire season. Bell is the most athletic of the big men on the team, and he may also need to give the Warriors some valuable minutes should Boogie’s injury prove longer term. For Cousins, that reality would be a dark end to a nice season where he looked to be slowly getting his form back. Though he did take his time in recovery, Cousins didn’t sit out the full 12 months that an Achilles injury typically requires, and it was clear early in his return that his strength and explosiveness was still lacking. Golden State doesn’t need Cousins to win it all (though it certainly would help to have him), but the hope was that he would be playing when they did. The extent of his injury remains to be seen, but we do know that this summer, Cousins is headed back toward free agency, and it seemed like this time, he could finally get the payout he felt he earned after a strong season in New Orleans. This inevitably, and unfortunately, may complicate that.